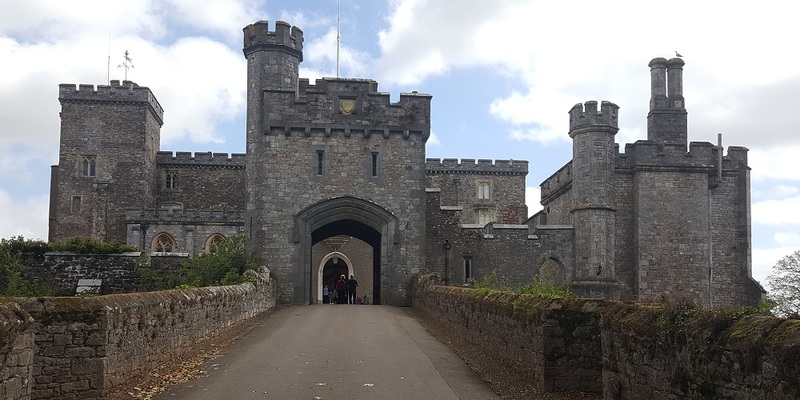 Lying within a lovely deer park in sight of the banks of the River Exe, Powderham Castle is situated approximately seven miles South East of Exeter. The 600 year old family home of the Earl and Countess of Devon is open from springtime through to the end of October, with extra events going on throughout the summer holidays. When buying your ticket from the hut, take note of any timings of extra events going on, as your tickets need to be issued at the same time. The Deer Park Safari tour operates twice a day, lasts around 30 minutes and costs an additional £2.50 per person. My six-year-old son and I both thoroughly enjoyed it; the commentary was good and you can get fairly close to the deer, with the tractor stopping every now and then for photo opportunities, and the ride is accessible to all. Any children’s events such as Wonderland, Knights and Dragons or Pirates are included in your child’s entry fee (or £3 each if admission was complimentary or discounted) but a ticket will be issued on a first come first served basis. Some of these events are run by the Devon-based Pocketwatch Theatre Co who are excellent and keep the children entertained for 45 minutes with trails to follow, dressing up and plenty of laughs – this really is a highlight of the visit. On entry, off to the left is a stoney path where you can walk along for around five minutes or so to the Walled Garden play area and pets corner. This contains some farm animals to see and pet, as well as a fort for the children to run around in and a speedy zip line. There is also a potting shed where you can have a go at planting seeds, giving you something to take home at the end of the day. This area is sloped but smooth grass, which is accessible for pushchairs, and there are toilets here as well. There is also a food hut if you are in need of any snacks or refreshments and picnic tables to eat at. On the way back towards the castle there is also an ice cream hut and Good Game (a local charcuterie) have got a burger stand for the summer too. Access to the main courtyard is via a sloped ‘driveway’. In the main courtyard is, of course, the stunning Castle towering above you which you can look around on a tour. The castle tour lasts approximately an hour and occurs every half hour, by tour guide only, with free roaming allowed from 3:45pm. The ground floor of the castle is accessible for wheelchairs, which apparently makes up ¾ of the tour so you will still get a great experience. You will be able to see the amazing rooms and hear the stories about the family told by very knowledgeable guides. Back out in the courtyard, there is the cafe with indoor and outdoor seating and on the other side is the Courtenay Gallery and gift shop. In the gallery there is seating with a video playing as well as a display of memorabilia. There are toilets available within the courtyard as well, including a disabled toilet, although it is more of a temporary structure. From here you can walk round to the back of the castle to the rose garden and chapel. The views from here over the deer park and seeing the estuary are fantastic and every now and then a train will pass by in the distance too. During the summer the Birds of Prey are out as well, with a static display at lunchtime and then a flying display mid afternoon. In the grounds there are plenty of trees with shade and areas to picnic and for little ones to run around and tire themselves out. The property has the benefit of plenty of free parking and you can also validate your full price entry with a free return visit within seven days. Please note there is a £5 minimum card purchase rule so do take change just in case. In addition to the castle and grounds, on exit, there is the Country Store, Food Hall and Toby Buckland’s Plant Centre. These are free to visit without paying the entrance fee if you wish to visit them during your stay. Accessible? The ground floor of the Castle is accessible to wheelchair users. A wheelchair is available for loan while in the Castle only. The tractor/trailer has a ramp and the Walled Garden Play Area and Pets Corner is accessible, although there are some steep slopes.